So how do you know if your horse or pony is just right, too fat or too thin? You need to condition score regularly, ideally every week. You will then be the first to notice if he has lost or gained weight and you can make changes to his diet and routine accordingly. The horse’s spine, ribs, tail head, shoulder and hips are prominent, with no fat covering anywhere. There is a slight covering of flesh over the shoulder, spine and tail head. Hollow quarters and a tucked up appearance in front of the stifle. Slight fat coverage over hips and ribs. Some hollowness through quarters and tucked up. Top line undeveloped, angular appearance. Outline of ribs discernible although covered. Scapula and hips are covered. Neck is reasonably well covered with some top line. Ribs not easily distinguished but can be felt. Well muscled top line, shoulders and neck blend smoothly into body. Fat around tail head feeling spongy. May have slight crease down the back. Fat over ribs feels spongy. Fat around tail head feeling soft. Starting to deposit fat down withers and behind the shoulder. Crease down back becoming obvious. Obvious fat deposits on neck and behind shoulders. Definite crease down back and fatty “pads” around tail head and over shoulders and ribs. Area along the withers is filled with fat. Large fat pads along ribs, shoulder, neck and over quarters and tail head area. Obvious crease down back and apple shaped quarters. Fat along the inner buttocks may cause rubbing when exercised. Flank area is flush with quarters and middle. 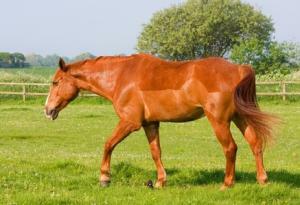 If your horse is too thin then it is important that you address this immediately. Call a reputable horse feed company careline for advice and speak with your vet. There are supplements you can feed to help gain weight such as Equivite Bodybuilder or Dodson & Horrell Soya Oil. If you are happy with your horse’s score but he doesn’t have all of the above signs then look to his diet. As the old saying goes ‘you are what you eat,’ which is true for horses. They need a diet high in fibre and good quality protein and if he is not getting this in his feed then you can look to add supplements to his diet.